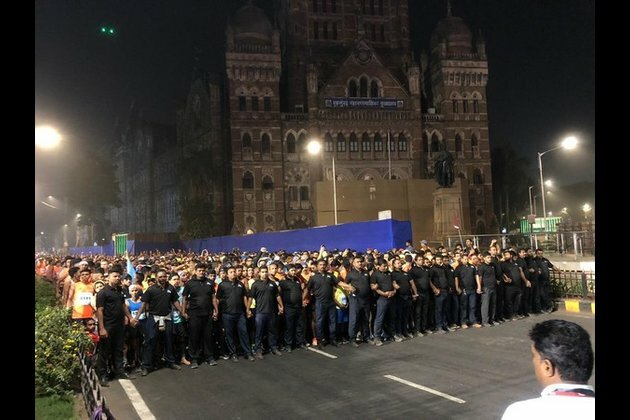 Mumbai (Maharashtra) [India], Jan 20 (ANI): Runners, amateurs and veterans have started running on the busiest roads of Mumbai to compete and complete India's biggest and prestigious Tata Mumbai Marathon 2019. With many first-time runners geared up for the 16th edition of the Mumbai Marathon on Sunday early morning, over 46,000 including some of the world's best runners hit Mumbai streets on Sunday early morning. The IAAF Gold Label Race was flagged off from outside the landmark Chhatrapati Shivaji Terminus (CST) by Six-Time World Boxing Champion and the event ambassador Mary Kom. The total prize money awarded will be USD 405,000. Along with the Mary Kom, the event was graced by South African Comrades Marathon champion, Bruce Fordyce. Popularly known as the 'Comrades King', Bruce has been the winner of South Africa's gruelling ultra-marathon for an unprecedented eight consecutive years, and nine times overall. Ethiopia's Abera Kuma is leading the men's field, while the women's field is headlined by the defending women's champion Amane Gobena. For the 2019 edition, Tata Mumbai Marathon had launched the initiative 'Mumkin Hai - Run for the Full' with Mumbai Striders, aiming to galvanise, encourage and assist amateur half marathoners to push their limits towards becoming a full marathoner.